Contrary to popular belief, the developed world isn’t the best role model when it comes to urban development. In fact, says Gerald Babel-Sutter, the founder and CEO of the Urban Future Global Conference, the developing world can learn more about what not to do from Europe and North America than what to do. In the face of a relentless wave of urban sprawl and car-centric planning, one European city is fervently swimming upstream, though. For the past several months, Oslo, Norway, has been attracting worldwide attention for its ground-breaking decision to ban cars from its central core. It’s a fitting setting, then, for the 2019 edition of the Urban Future Global Conference (UFGC), held May 22-24, where mobility and car-free streets are some of the key themes. Oslo began restricting car traffic last year, removing 700 downtown parking spots. 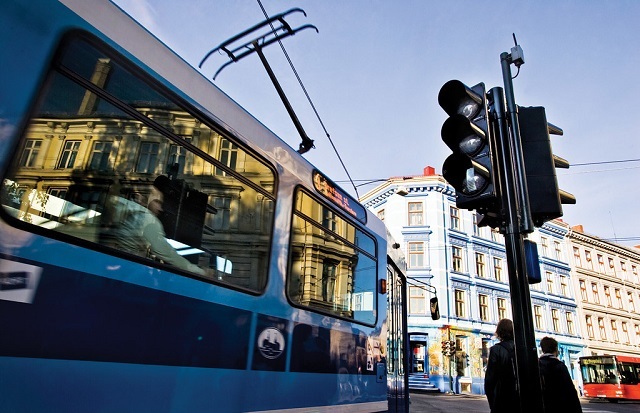 The city has already experienced a 10% increase in pedestrian traffic and 4% growth in the use of public transit – the equivalent of 16 million additional trips, according to Oslo’s public transit agency. “We also found that people were spreading out and accessing a larger area of the city center through a combination of walking and public transit than before,” observes Hannah Marcussen, Oslo’s vice mayor for urban development. Norway is backing electric technologies to reduce emissions too. Currently, 77% of new vehicles sold in Oslo are electric and the city is in the process of adding electric buses, trucks, taxis and ferries to the public transit fleet. Carolina Tohá, the former mayor of Santiago, Chile, is one example. During her time in office, Tohá “had a very ambitious plan to change Santiago,” Babel-Sutter says. “She wanted to do sustainable mobility and focus on biking and walking in order to make things better for the people who lived there. And they implemented a lot in a short period of time.” The change was so rapid, though, that she received great pushback from drivers and the media, who portrayed her as anti-car. She lost reelection. But, ironically, her successor saw how well these new solutions were working and left them largely untouched. Another innovation Babel-Sutter hopes to give more exposure to at UFGC is Mexico City’s Laboratorio para la Ciudad (“Laboratory for the City”). Gabriella Gómez-Mont, the founder and former director of this experimental think tank, will be speaking about how they addressed challenges and problems city officials had long sidestepped. “Whenever politicians were dealing with a topic they felt was too hot, they basically turned it over to this laboratory for the city and said, ‘here you worry about it and if you can work it out, fine…you take the glory. But if it doesn’t, you take the blame,’” says Babel-Sutter. Babel-Sutter also points to Clara Muzzio, the Undersecretary of Pedestrian Ways for Buenos Aires, whose job it is to improve the city’s 320,000 sidewalks, as an urban leader who has lessons to teach. Mark Wessel is a writer and public speaker who profiles unique city initiatives tied to sustainability, resiliency and quality of living that other communities can learn from. In addition to TheCityFix, his work has appeared in Next City, Municipal World, Cities Today, Urban Future and selected Postmedia newspapers.